Clothing/Jewelry Description A white shirt, red flower-print shorts, and white sneakers or a red t-shirt with "Tom" on the back in white letters, white pants or shorts, and sneakers. Distinguishing Characteristics African-American female. Black hair, brown eyes. Some accounts give Tilwanda's name as "Tawana," "Tiwanda," "Tilawna," or "Tiwana." She wore her hair in a ponytail or braids at the time of her disappearance, and she has a dark skin discoloration on her left arm or left leg. 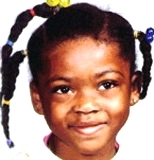 Tilwanda was last seen in her hometown of Aiken, South Carolina on August 11, 1989. She resided with her parents in the Balltown area on Jack Jones Street near Highway 19. Tilwanda was visiting relatives at the time of her disappearance. She became angry when her mother told her she must return to her home. Tilwanda took spare change from a jar in her mother's kitchen and left her house. She was last seen by two neighbors at approximately 5:30 p.m. at a Quik Stop convenience store a few blocks from home. She has never been seen or heard from again. Two weeks after Tilwanda disappeared, her grandmother was arrested and charged with obstructing justice in her case. Police stated Tilwanda's grandmother wasn't a suspect in her disappearance, but she had lied to them many times and may have been trying to cover up what happened. Investigators have looked into the possibility that Tilwanda is living with relatives, but those theories have not produced any leads and have been cast aside. She had a history of running away from her family's residence, but it is not clear what happened to cause her disappearance. She may have been abducted. Tilwanda was an honor roll student at North Aiken Elementary School in 1989. Her case remains unsolved. Updated 4 times since October 12, 2004. Last updated January 20, 2015; age-progression updated.